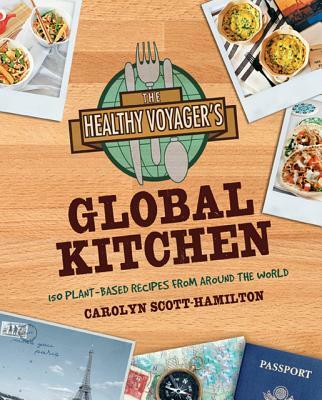 Win The Healthy Voyager's Global Kitchen! Yesterday I sat outside in the beautiful sunshine and ate my lunch. It’s been a warm winter in Ohio, the days feeling much more like summer than winter. I’m not complaining really, I prefer warm weather to snow. I had put the birdbath back outside earlier in the day, and I watched familiar birds and squirrels join me in a noontime meal. I was eating a bowl of Chunky Sweet Potato Stew and its spicy sweetness was the perfect compliment to the warm rays of sun. This African-inspired dish from Morocco is made with chunks of sweet potatoes, carrots, and vegetables married with a rich- and slightly spicy, coconut curry broth. It is, simply superb- in looks and taste. This dreamy stew comes from The Healthy Voyager’s Global Kitchen by Carolyn Scott-Hamilton, the creator and mastermind behind The Healthy Voyager web series and radio show. Let your taste buds travel to Argentina, Italy, South Africa, Thailand, Greece, and more- all without having to break out your passport. This gorgeous cookbook is jam-packed with tantalizing recipes from around the globe, 150 to be exact. Sinful Sticky Toffee Pudding. Bolognese Baked Gnocchi with Spinach. Seitan Wienerschnitzel. Carribbean Callaloo. Kele Wele, just to name a few. All gloriously vegan. I’m just going to come right out and say it- I love this book for so many reasons. First, I love the overall design of the book. The recipes are grouped by locale, making meal planning a cinch. There’s a quick reference legend for special dietary needs on each recipe, shopping lists, and kitchen tips. But really what shines in this book are the recipes- and of course the photos, they’re pure candy for your eyes. I’m already planning my next taste bud tour, I’m thinking Just Like Oma’s Apfelstreudel (Apple Streudel) will fit the bill nicely. Before becoming vegan, I had been eating my own Oma’s Apfelstreudel all my life- I can’t wait to try this vegan version. And now you can too! Enter to win your very own copy of Global Kitchen, your tastebuds will thank you over and over again. No purchase necessary. Void where prohibited and all that. Contest runs March 15, 2012 through March 19, 2012. To enter to win one copy of The Healthy Voyager’s Global Kitchen, you can do any of the actions below. Each action counts as a separate entry, so make sure you leave a comment for each one you do! Winners are selected from these comments only. So many ways to enter, so many ways to win! Good Luck! Tweet about the giveaway! Make sure you link to this post! Follow The Healthy Voyager on Twitter. Like Your Daily Vegan on Facebook. Like The Healthy Voyager on Facebook. Mention this giveaway on your own blog or in a blog post! Gratitude and thanks to both Carolyn Scott-Hamilton and Dalyn Miller for graciously sending me some of their products to review. Disclaimer: Views and opinions expressed here are those of YDV and derived from personal experience. These opinions are not influenced in any way by the receipt of goods or services. We will always notify you when a product has been given to us to review, test, use, or talk about. Sounds delicious, would love to try the recipes! I’m in college for business at this point so I could open a vegan restaurant. This book sounds like the perfect book to expand my avenues!! Also follow Healthy Voyager on Twitter – thanks again! Also follow Healthy Voyager on Twitter too – thanks so much! These recipes sound so healthy and delicious – would love to try them! I also just liked you Daily Vegan on FB too – thanks for the giveaway! Would love to learn some new vegan recipes! Oh I would really love this! Looks like a great cookbook. Thanks for the chance to win! Looks delicious – thanks for the giveaway opportunity! Looks delicious – thanks for a great giveaway opportunity! I’m enjoying the warm weather in OH too! Looks like a great book. This book sounds great, I need to branch out with recipes more! Excited to try some international favorites-vegan style!! I love the Healthy Voyager, and I have the travel bug myself. I spend most of my time on the road, so I keep my cast iron and food processor in the trunk! :) I would love to win this cookbook!!! I’m from Michigan and we’ve also had some oddly, but delightfully warm weather for this winter – almost 80 degrees today! Anyway, I would love to have this book, I’ve been vegan for only a month & have done a lot of creating my own meals with whatever I have or some recipes online and have been wanting to get a cook book! Looks awesome! I love international food and I am expanding my vegan cooking (I am also giving away a vegan cook book on my blog this week! More delicious vegan cooking – a must have! A great recipe! I am a vegetarian and always on a look out for healthy food that tastes yum. Love it! I will be posting it on hashtip to share with fellow vegans/vegetarians today. Thanks! This looks amazing! I’m hungry just reading this post. Wow, as a fairly new vegan, I’m always looking for new recipes. This one sounds amazing! The weather in Texas has been wet and warm enough that the bluebonnets are everywhere! Sitting outside with lunch or supper is just incredible!